Bordeaux Neurocampus > Commented publications > H.Zhang, D.Choquet, Y.Humeau et al. in Nature commun. H.Zhang, D.Choquet, Y.Humeau et al. in Nature commun. Huntington’s disease: correct the abnormal mobility of glutamate receptors to improve early cognitive deficits? Huntington’s disease is a hereditary neurodegenerative disease that causes cognitive and psychiatric disorders, and uncontrolled movements. Combining high resolution microscopy with pharmacological approaches, a national and international collaboration has discovered the mechanism responsible for the dysfunction of synapses in neuronal models of Huntington’s disease. Researchers have identified a molecule capable to improve cognitive functions in Huntington’s disease mouse models. These results are published in the journal Nature Communications. Affecting nearly 20,000 French citizens, Huntington’s disease (HD) is a rare and hereditary genetic disease due to the mutation of the gene coding for a protein called huntingtin. There is no treatment to stop or slow the progression of HD symptoms. HD is associated with degeneration of neurons in a part of the brain involved in motor, cognitive and behavioral functions. The mechanisms that lead to this neurodegeneration are not yet clarified. The symptoms of Huntington’s disease are many and varied. They generally associate motor, cognitive, and psychiatric disorders. The most visible symptom is chorea. It is manifested by sudden and involuntary movements gradually extending to all muscles. However, cognitive disorders often appear early, evolve in parallel to motor disorders and are highly disabling. While cognitive disorders have generally been associated with neuronal degeneration, several recent studies have suggested that alterations in neuronal function in the hippocampus – a region of the brain involved in memory- could be the basis of early cognitive deficits. Specifically, the function of synapses, central to communication in the brain, is altered in patients and mice models of HD. However, the molecular mechanisms responsible for the dysfunction of synapses in the hippocampus have not been identified to date. 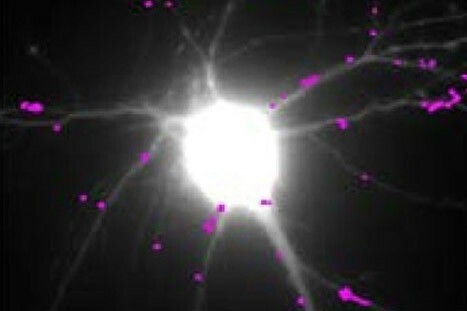 Teams at the interdisciplinary Institute of Neuroscience (CNRS/University of Bordeaux), in collaboration with several other laboratories, conducted an interdisciplinary study combining high resolution imaging techniques, biochemistry and behavior on several mouse models of Huntington’s disease. In this study, the scientists discovered the molecular mechanism linking the huntingtin mutation to synaptic deficits seen in mouse models of Huntington’s disease: the decline in production of BDNF (Brain – Derived Neurotrophic Factor), a neurotrophic factor essential for the function of neurons and their survival, induces an abnormal increase in the movement of glutamate receptors. These receptors are at the base of fast excitatory synaptic transmission in the brain, and their movements regulate synaptic transmission efficacy. Abnormal receptor movements at synapses of HD mice prevent them from responding normally to neuronal stimulation and probably underlie learning deficits of these mutant mice. The researchers also identified a molecule used normally for the treatment of depression – tianeptine – able to correct the defective BDNF production and to restore normal mobility of glutamate receptors as well as the memory of mice that express the mutated huntingtin. This work extends our knowledge on the relationship between abnormal mobility of glutamate receptors and cognitive deficits. It reinforces another recent work from the same team linking deficit in receptor mobility to dysfunction of synapses in Alzheimer’s disease, another major neurodegenerative disease. This study opens a new therapeutic pathway to try to correct early cognitive deficits in Huntington’s disease.